Rachel Notley Says Next Saskatchewan Premier Can Learn From Alberta. Brad Wall Fires Back. She said the next premier should "reconsider the approach" Saskatchewan has taken. 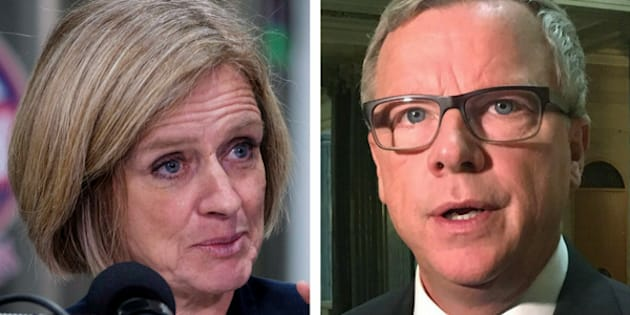 CALGARY — Alberta Premier Rachel Notley has some advice for the next leader of Saskatchewan: handle the economy differently than the government has under current premier Brad Wall. The governing Saskatchewan Party is to choose a new leader later this month to replace Wall, who announced last summer that he was leaving politics. Wall rose to national prominence for his down-to-earth style, sharp wit and, more recently, his willingness to lock horns with Ottawa. The conservative politician has also been known to trade jabs with his left-leaning Alberta counterpart on everything from provincial budgets to beer taxes. There's also been an interprovincial spat over Saskatchewan banning Alberta licence plates on trucks working on future government road and infrastructure projects. Notley said whoever wins the Saskatchewan Party's leadership race can learn a thing or two from Alberta. "I believe that the advice I'd give to the new premier is to look at the facts, look at the data, look at the reporting on economic activity and reconsider the approach they've taken up 'til now, because one province is making its way out of a recession and one is not," Notley said Thursday during a visit to Calgary's Minhas Micro Brewery. Alberta Premier Rachel Notley, right, gestures as she tours a microbrewery in Calgary, Alta., Jan. 18, 2018. The brewery said it has been able to grow its business thanks to NDP policies. "One province is adding tens of thousands of new jobs; one province is losing jobs. I would suggest that they should look at the data and start drawing some different conclusions." Wall responded to Notley's comments with a few rhetorical jabs of his own. He said his advice to his successor will be to not listen to an NDP premier who imposed a carbon tax on her oil-dependent economy and is presiding over an annual $10 billion deficit. Wall also accused Notley of not standing up to the federal government. "Rather than defend her province against carbon taxes imposed by the Trudeau government, this is a premier who actually called her own province 'Canada's embarrassing cousin that nobody wants to talk about,'" Wall said in a statement Thursday night. "Well I am proud to talk about both Alberta and Saskatchewan and their huge contribution to the country. If her government is not prepared to defend the interests of Alberta, we are happy to help." Five candidates who hope to lead the Saskatchewan Party face a vote on Jan. 27 in Saskatoon.